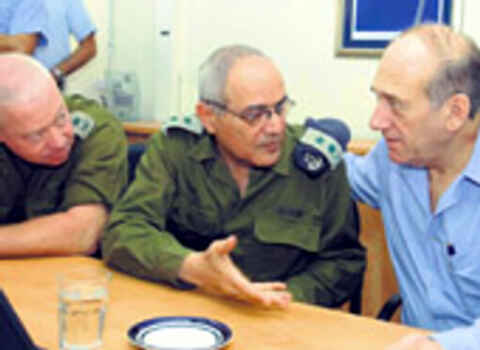 From left: Yoav Gallant, commander of the IDF southern command, Dan Halutz, Ehud Olmert. Judging from below report from a press conference of the mayor of Beit Hanoun, the "soldiers" of the Givati criminal rabble were not content with murdering and injuring hundreds of people, destroying property valued at millions of dollars, destroying the livelihood of a whole city during their so-called "Autumn Clouds" operation, but they also had time to steal cellphones, gold (which is the most widely used form of saving in Palestine) and other private property from the homes of impoverished people who are already under a genocidal regime of starvation. It is obvious that these Israeli Jews from the Givaty Unit did not steal because they are hungry, but that they stole because they are thieves. The Mayor of Beit Hanoun, Muhammad Nazek Al-Kafarneh, said during a press conference he held after the recent massacre, that the Israeli soldiers participating in the so-called “Autumn Clouds” operation in the city used the ocassion to steal Palestinian property: money, gold, cellphones and other valuables. - The total value of things stolen from private persons and households amounts to over 200,000 dollars. - The loss due to damages to water equipment is 350,000 dollars. - The loss due to damages to the infrastructure for processing wasted water is 450,000 dollars. - The loss due to damage and destruction of Palestinian houses amounts to 2,5 million dollars. - The loss due to damages to road infrastructure amounts to 3,5 million dollars. - The loss due to damages to the public gardens and the children gardens amounts to 200,000 dollars. - The loss and the damages of the electricity net are 2,5 million dollars. - The losses to the economy of the city amounts to one million dollars. - The loss due to damages to the communication net amounts to 1,5 million dollars. - The loss due to damages to public property amounts to 1,5 million dollar. 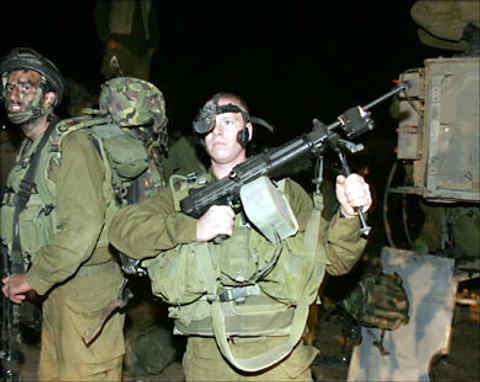 A soldier and an officer of the IDF, preparing for the "Autumn Clouds" operation. Any information such as exact ID, unit, nationality ... of these two soldiers for eventual future indictment and prosecution as war criminals will be greatly appreciated. The mayor said that the Israeli terrorists destroyed 25 public facilities of the city, and other 25 facilities were damaged partially. He gives the amount lost due to these damages as half a million dollars. Further, mayor Al-Kafarneh said that 40 shops were destroyed completely; the loss due to the destruction of these shops is 200.000 dollars. The losses of the city in the sectors of agriculture and health are not counted among the losses given above. A Dead family from Beit Hanoun on their last way. people everywhere in Palestine see such images on a daily basis not as pictures but live and anywhere they go, and that this genocide is supported equally by ALL western countries, the EU and the UN. If you live in any "western" country, your taxes are very probably financing what you see here. Speak with your politicians if you do not like what you see. When the the psychopaths and moral degenerates who commit these acts with the help of your governments stop commiting them, I (and others) will stop publishing these images. I have been busy with the problems related to my exile for a long time. Since the criminal State of Israel denied me the right to work as a journalist in my homeland Palestine and forced me to flee to Europe, many problems appeared in my life. I often ask myself why the U.S.A does not stop donating to Israel the bombs which they use against the Palestinians in Gaza and the West Bank. What, ever, have we done to the USA ? Why did the U.S.A send military detachments to Israel after the Israeli lost the war in the south of Lebanon? The Israeli military radio, "Tsahal Radio" announced these news. They said that the American detachment of officers had arrived in Israel to take part in the "Autumn Clouds" operation in Gaza, that they helped the Israeli military to perform their "killing duties" without any loss. American officers were involved in the last Beit Hanoun massacre, in which in one incident 20 Palestinians were killed, at least 60 innocent children, old men and women were injured. Israel had to defend themselves from her, so they did this. The question poses itself, why is the political discourse of the European countries still fixated on the crimes against the Jews over 60 years ago, all the while allowing and even supporting the perpetration of the big disaster which befalls my homeland Palestine? Why do all European politicians keep silence about all the crimes which the Israeli perpetrates in Palestine ? Are they scared that the Jews will return to Europe, or are they themselves involve in these crimes? Is it logical that the European countries signed the convention against Genocide, and then they impose a siege against the Palestinian and create conditions for real starvation for another nation in another land. 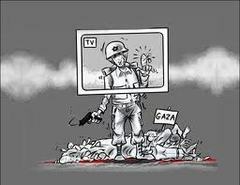 Why does the international media impose a veil of silence over what is happening in Palestine, the concentration camps which are Gaza and the West Bank? Never anything comes out in the media, the TV, the newspapers. The media only relates minor incidents, or, in a hugely inflated manner, when something small happens against the Israeli occupation terrorists. As far as I am concerned, all the western media is complicit in this genocide. They had to amputate both his legs because of an "error". Since the Palestinian resistance captured the Israeli-French criminal, "soldier" Gilad Shalit on June 25, the Israeli criminals have been slaughtering Palestinians everywhere in Gaza. Since then 396 Palestinians have been killed, 4600 Palestinian have been injured according to the Palestinian statistics which published in the newspapers, among them 1700 child. 940 Palestinians among these injured are permanently disabled, 135 lost organs of their bodies, 54 of these Palestinians suffered third degree burns. The Israeli criminal State is using new, forbidden weapons. Nobody knows what they are. These weapons inflicts vicious wounds which will burst into flames when exposed to air even after the initial infliction. Israel also uses Uranium shells in Gaza, this is a war crime. Palestinian Dr. Joma’a Sakka’a said that the bodies of dead Palestinian victims which reach the Al-Shifa Hospital desintegrate into crumbles and liquid. The organs inside the bodies of the victims are totally burnt and carry small pieces of metal which can’t even be seen under the X-ray, also, a white powder covers the internal organs of the victim’s bodies. The Doctor said when we try to open the injuries, they do not see the splinters which had inflicted the wounds, and could not identify the damaged area even after opening the bodies. The doctors said that the injuries must be inflicted by a new, unknown weapon as they had not seen injuries like that before. These are serious injuries which leave the victims shredded and covered with burns. Even in cases when the doctors medicate them successfully, the victims die after a couple of days for unknown reasons. 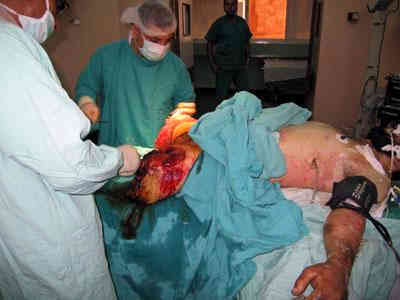 Leg injuries inflicted by new Israeli weapons. The flesh is apparently burnt and desintegrates into crumbles and liquids. The results of the sample of the injuries which the Palestinians sent to Parma University in Italy shows that the weapon which was used against the Palestinian civilians in Gaza included a very high percent of Carbon, and also copper and other metals. This kind of weapon has been tentatively identified as a multiple explosion carbon missile (DIME) which has been developed in the U.S.A. The Beit Hanoun massacre, a day of bloody clouds. On November 1, 2006, the number of the Palestinians who were killed in Gaza during the "Autumn Clouds" Israeli military terror operation reached 86, and at least 265 were injured. This happened before the criminals of the Israeli State perpetrated the now generally known massacre in Beit Hanoun. The morning of November 8, 2006, Israeli tanks shelled Palestinians in their homes in the northern Gaza town of Beit Hanoun. They fired eleven shells into six homes, killing at least 20 Palestinians, wounding some 60 more. The Irony is that this attack comes a day after Israeli troops pulled out of the town after a week-long offensive in which dozens of Palestinian died, and hundreds were injured. There used to be a house here. Now only a pool of blood remains. happens to their bodys .. the Palestinian Health ministray believes that some nuclear radiations might be contented in these weapons , as they can not really understand what is going on till now. as i said more than 90 were killed and more than 500 wonded, tens in danger ... and more than 100 handdicapped as the type of weapons they use ..
the israelis destroyed many houses, and they killed many trees in simple words a New Jenin Camp if you remember what happened in Jenen, they destroyed roads, electricity and water nets.. in simple words what happened was a n earth quack, during searching some houses they stole what they found, some cellphones and PCs and gold what is happpening now that they israelis partially withdrawn from Beith Hanoon, but not completely as some media say, for that more than 9 were killed yesterday morning by israeli snipers, or air raids and the army still ocuupying and having terrorist militant activities against civils which caused tonight some thing that happened which might be good to consider here, is an israeli aristrike against the house of Jamila AL-Shanty, the member of the Palestinian Legaslative Council which caused the death of her sister and her sister's husband and an other passer about the school bus it happened the day before, they shot the female teacher insidet he bus in front of little kids about 4 and 5 years old , imagine how would they grow up ? today there has been aggression using arsenal, the israeli arsenal killed more than 20 civilians as they bombed houses over the heads of the inhabitants, so many kids and women were killed or injured this morning..."
Each time I read about the criminal Israeli operation in Gaza, seeing the increase in the number of the civilian victims, I swallowed my pain and closed the computer. Until that evening, a day after the Beit Hanoun massacre, when I saw a group of Jews lead a demonstration against an Austrian rightist group which has its office near my house. 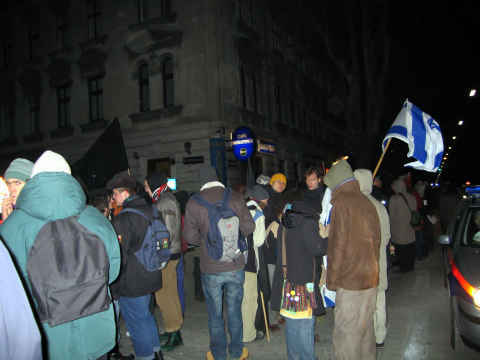 Zionists protesting against "fascism" and "anti-semitism" in Vienna. What do these deluded people think that zionism is, if not fascism and anti-semitism ? - Who are the real Nazis: the war criminals in Israel, or these Austrians who use that basement office as a place of reunion in excercise of their rights under Austrian law ? - What, ever, did these Austrians do to anybody ? Hold political opinions which are not popular ? And for this they are terrorized and insulted as Nazis on a regular basis? How can it be that such a criminal nation has the gut to complain about the deplorable things which befell them in the past, while they are perpetrating massacres and crimes on a daily basis, often worse than the most extreme crimes attributed to the Nazis, against the civilians of another nation, namely the Palestinian population jailed in Gaza and the West Bank ? Have they no decency ? 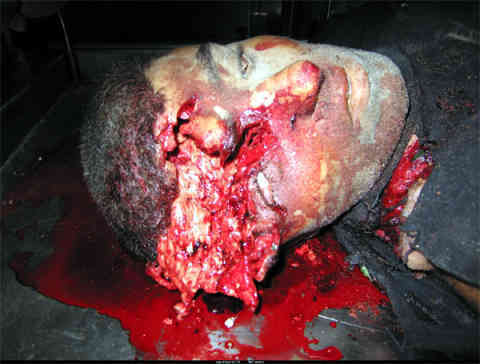 The face and head of this person was melted away by the new American weapons which Israel is using. In Beit Hanoun, some of the shells landed on a home, killing 11 members of one family called Al-'Athamneh, including a 9-year-old child and a 73-year-old woman. The other shells landed on other five homes at Hamad Street in Beit Hanoun. Other victims were from the Al-Kafarneh family. Muhammad Athamneh described the massacre to Palestinian newspaper Hayat Al-Jadidah. He said that the killed were children, women, and old men, that they had killed his mother, sister, uncle and his six sons, and four sons of his second uncle. Who believes that? This boy was sleeping, so they killed him like this. Athamneh said that it was 5:30 at the morning, everybody were sleeping, when they heared the very strong blast of the first explosion which landed at his cousins house, followed by screaming and crying. He ran out, found his relatives, old and young men running in the streets, escaping from the shelling and looking for protection in other places, but that this did not help them to escape from the Israeli shelling. The "Autumn Clouds" rained missiles on their heads. They all were killed on the roads. The whole place was converted into a collective grave. 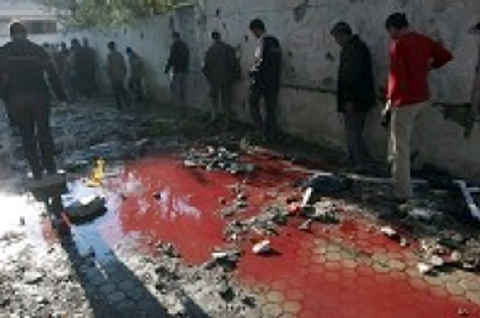 Athamneh was shocked, he did not know how to save the life of his family and relatives, everybody was bleeding and the floor was covered by a big pool of blood! He saw the horrible death in front of his eyes. His cousin’s wife died with her two children while he was screaming and seeking the Ambulance. Nobody was able to come near under the heavy, blind shelling killing everybody moving in the area. The sky rained blood that day. He was probably running away, so they shot him thru the head. Today Saturday, the US, who said in advance that Israel has the right to defend itself and gave the Palestinian resistance the responsibility for the massacre, vetoed a draft UN Security Council resolution condemning an Israeli attack in the Gaza Strip that killed 20 Palestinian civilians and injured more 60. The disgusting American Psychopath Bolton described the text as "unbalanced" and "biased against Israel and politically motivated". Does anyone wonder why the Palestinian resistance is shooting missiles toward Israel, which by the way never really reach anything? The reason is simple: the big concentration camp which is Gaza, where a million and a half people are caged, impoverished and hungry, and where almost all civilian infrastructure has been left in ruins by Israel. The increased poverty and real hunger which the Palestinians suffer in their reclusion, the shortage of food for the children, the damaged infrastructure which the occupation left behind, the closed entrances of the city, the daily killings and destruction - including the bombing of the power station - in Gaza, these reasons are enough for anyone to fight against the Genocide and look for a better life to live. Does anyone wonder how much the face of the Israeli occupation is bloody, ugly and inhuman ? Does anybody wonder how much the American leaders are criminals in their support to Israel ? When will the world give Israel a firm ultimatum to stop the occupation, the genocide which has been going on for about 60 years now ? 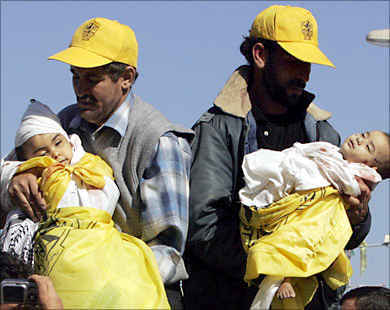 Carrying babies to their graves in Beit Hanoun. 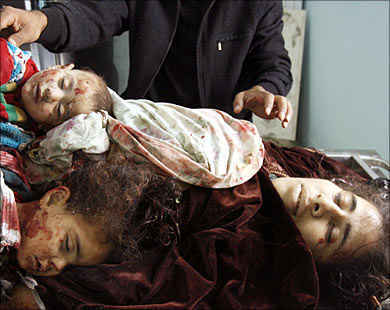 They died because western politicians are cowards and racists under the heel of the zionists. Why did the European politicians not adopt the request of the Palestinians, who asked for European military forces to be sent to Palestine to protect them and the infrastructure from the Israeli crimes ? We are really seeking International military forces to stop the bloody crimes against Palestine, to make a halfways normal life possible. 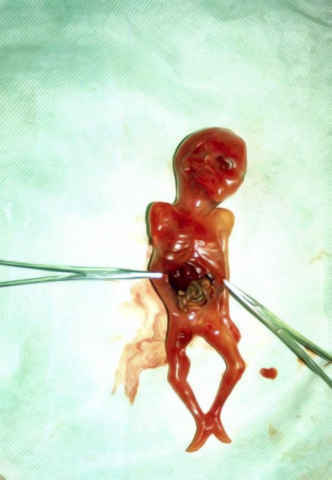 This child was not yet born when it was shot by an anonymous soldier for zionism. The Palestinians Authority does not really exist any more, Abbas and the people around him don’t have even the power to protect their underpants. The Palestinian civilians lost their trust to the P.A. long time ago, when it became evident that they are a bunch of corrupt, sold-out traitors. The Palestinian civilians are seeking protection against the jewish criminals, and they will be thankful for anybody who will stop the crimes commited against them. Please, send military forces to stop the Israeli rampage in Gaza and the West Bank. Part of the images here come from the Al-Ittihad newspaper, part of them were submitted by somebody from Beit Hanoun who lost seven friends and relatives during this last Israeli rampage. His only comment was "that's life", because he knows, as all those who live in Gaza, that his life is worth nothing. The Palestinian Center for Human Rights in Gaza reported on Thursday that the Former Israeli Cheif of Staff, Moshe Ya'alon, had to flee out of New Zealand this week after an arrest warrant of war crimes was issued by a New Zealand court after several lawyer contacted the police to urge Ya'alon's arrest. 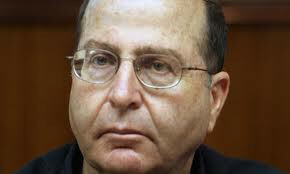 Organizations filed an appeal to the court to arrest Ya'alon who was on a private visit to the country. The appeal depended on an incident that took place in 2002, when Yaalon ordered the army to assassinate a Hamas leader, Salah Shihada, by shelling his house. The shelling caused excessive damage, and 15 civilians, including several children were killed. The PCHR stated that he Auckland District Court issued a warrant for Ya'alon's arrest on charges of war crimes stating a "suspicion of committing a grave breach of the Fourth Geneva Convention 1949," a criminal offense in New Zealand under the Geneva Conventions Act 1958 and International Crimes and International Criminal Court Act 2000. The court issued the warrant after several lawyers contacted the police to urge Ya'alon's arrest. It is worth mentioning that Shaul Mofaz, the former Israeli Minister of Defense, and a senior military officer known as Doron Almog, escaped arrest warrants in the U.K for similar offenses. The PCHR argues that Ya'alon is responsible for military actions that constitute extensive violations to the principles of Human Rights and are considered war crimes. The warrant against Ya'alon was cancelled at the last minute by the Local Justice Ministry despite the decision of District Court Judge Avinash Deobhakta, who ordered the arrest of Ya'alon. Anti-Semitic attacks in Europe have risen sharply in the months since Israel’s summer war with Hizbollah in Lebanon, according to the World Jewish Congress. The UK saw a particularly sharp increase in the number of incidents, with 132 anti-Jewish acts recorded in 33 days in July and August, according to a report published on Sunday. France too, with the world’s third-largest Jewish community outside Israel (after the US and Russia), saw a 79 per cent increase in anti-Semitic acts since July. Thomas Hammarberg, commissioner for human rights at the Council of Europe, also warned that the groundswell of support for extremist rightwing views was bringing racism and anti-Semitism into mainstream European politics. “Other political parties have had to adjust, not to be outflanked,” he said. Meanwhile, Edgar Bronfman, the WJC’s president, hit out at the “weak, divided and unfocused” approach of the world’s main powers in failing to impose economic sanctions against Iran over its nuclear ambitions. “Neutrality [on sanctions] is not an option . . . In this century danger lurks behind every turn. “No nation and no people can feel safe and secure,” Mr Bronfman told a meeting of the WJC board in Paris on Sunday. The meeting brought together more than 100 Jewish leaders from around the world.